David William Lyons was born in 1943 in Mansfield, Nottinghamshire. He learned to play guitar and chummed up with fellow Nottinghamian, Graham Anthony Barnes (1944 – 2013). Graham went to the Margaret Glen-Bott School in Wollaton was influenced by his parents' collection of jazz and blues records, Aged 13 he got his first guitar and wanted to be the next Elvis Presley. In 1960, David (now Leon Lyons) and Graham (aka Alvin Lee ) are in the “Atomites” with drummer Pete Evans and Ivan Jay and Roy Cooper (rhythm guitar) . They soon become “Ivan Jay and the Jaymen” and prove popular in the Nottingham/Mansfield area of England. When Ivan Jaye and Roy Cooper leave in 1961, the trio become The Jaymen. More name changes with “Jaycats” then the “Jaybirds” and in 1962 Pete Evens is replaced by Dave Quickmire. Ric Lee, (drummer with The Mansfields), completes the line-up in 1965. A year later the Jaybirds have moved to London and become the touring band for “The Ivy League”. Chick Churchill (keyboards) joins the group. After they were signed to Chris Wright, as their manager they changed and their name to Blues Trip (sometimes billed as the Blues Yard) and played one show at the Marquee Club supporting the Bonzo Dog Doo-Dah Band. In 1967, the group became “Ten Years After” and signed with Chrysalis Records. Leo Lyons changed his stage name to Ivan Harrison and joined Alvin Lee on vocals. The name ‘Ten Years After’ may have originated from Lee’s love of Elvis and because the group formed a decade after Presley, whereas others believe, Leo Lyons took the name from a book title, Ten Years After The Suez. In any event, the newly named band became residents at the Marquee, London and accepted an invitation to play at the Windsor Jazz Festival in 1967. The band release ther first album later the same year. The band toured Scandinavia and the United States before recording their second album, the live Undead (1968) at, Klooks Kleek, in London. By now Alvin Lee’s master of the guitar is evident using an eclectic mix of pentatonic scale and other modalities. Their next album, Stonedhenge, sold well and reached 61in the Billboard Album Charts. "Hear Me Calling" was released as a single in the UK. Ssssh (1969) was the band’s third studio album charted #20 on the Billboard 200 and #4 on the UK charts. In the US, Ten Years After became a firm favourite at live festivals and appeared in 1969, at Newport Jazz Festival, in early July; the Seattle Pop Festival later in the same month and on the 17th August featured at Woodstock. On the 1st September the band were were playing at the Dallas International Motor Speedway, Lewisville, Texas. The band released Cricklewood Green (1970) which made Number 14 in the Billboard charts. "Love Like a Man", was released as the single and gave the group their only top ten hit in the UK. The single was collectable because the A-side was recorded at 45 rpm whilst the B-side (recorded live at the Fillmore East) had to be played at 33 rpm. This marks the beginning of novelty marketing which would become a common feature with picture vinyl later in the decade. 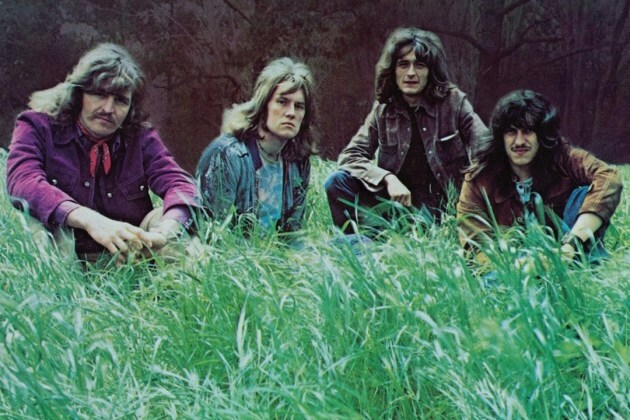 Ever popular as a live band Ten Years After appeared at many festivals including the Isle of Wight Festival. A Space in Time (1971) was the first album released on Columbia Records and was less heavy and more commercial. "I'd Love to Change the World" gave the group their biggest hit in he UK, and "Baby Won't You Let Me Rock 'n' Roll You" also charted in the US. Deram continued to release compilation albums to cash in on the groups following but Rock & Roll Music to the World (1972) and the double album, Ten Years After Recorded Live (1973) on Columbia Records contained new material. The live album was recorded over four nights in Amsterdam, Rotterdam, Frankfurt and Paris. Alvin Lee was unhappy with the musical direction the band and after their final 1974 Columbia album, Positive Vibrations (1974) was released the band broke up. The band subsequently broke up after their final 1974 Columbia album, Positive Vibrations (1974). The members reunited to play the Reading Festival in 1983, with all the original members. They were back again in 1988, to appear live and record the album About Time with producer Terry Manning in Memphis. Alvin Lee was replaced with Joe Gooch, on their album, Now (2003). Alvin Lee mostly played and recorded under his own name following his split from the band. He guested on a couple of country rock albums in 1973, On the Road to Freedom, with Mylon Leferve; on Jerry Lee Lewis’s double album The Session...Recorded in London with Great Artists (1973) ; and guested on a couple of tracks on Bo Diddley's The 20th Anniversary of Rock 'n' Roll all-star album (1976). He formed Alvin Lee & Company in 1974 to play a show at the Rainbow , The band released three albums In Flight (1974), Pump Iron! (1975) and Let It Rock (1978 ). He also palyed with Tom Compton (drums) and bass player , Mick Hawksworth in "Ten Years Later", and they released two albums, Rocket Fuel (1978) and Ride On (1979), as well as extensively touring Europe and the United States. Alvin died in 2013 from complications during a routine medical procedure to correct an atrial arrhythmia. Leo Lyons continued in the music business as studio manager and producer. He played in a reformed Ten Years After, until 2014, and continues to perform and record with "Hundred Seventy Split". Ric Lee formed the publishing and recording company, March Music/Fast Western Productions. He also continued to perform with The Breakers, then later 'Ric Lee Blues Project' (soon to be known as 'Ric Lee's Natural Born Swingers') for their 2012 album release 'Put a Record On'. Chris Churchill set up Whitsett Churchill Music Publishing with Tim Whitsett, publishing and promoting American artists, especially from the south.